WonderBoard is now called WonderBoard Lite and is 20% lighter than its previous iteration. But is this change enough to help this backer board compete with other big dogs of the industry, like Durock or HardieBacker? WonderBoard does have some limitations, such as edge integrity. But it has other advantages, lower pricing being the chief advantage. WonderBoard is a cement-based backer board mainly used for tiling in wet places. Specifically, its components are Portland cement, EPS beads, aggregates, and fiberglass reinforcement. The wet places are mostly bathrooms—specifically, showers and tub surrounds—and the applications tend to be tiling. It is also used for decks, floors, countertops, pools, and hot tubs. When you lay down tile, you need a backing base—a "backer"—that will accept the thin set mortar. For flooring in kitchens, that backing is usually just plywood or another type of organic-based (wood) material, because this flooring is not subject to much water. The layers of tile and mortar, seamed with grout, do an admirable job of shedding the minimal amounts of water that splashes in kitchens and even in the general floor areas of bathrooms. Showers and the like are a different matter. Water continually pounds these surfaces and eventually will work its way below. All it takes is a little pinprick-sized hole in the grout, and that water will travel to the tile base. If the tiler uses green board—a type of drywall that is a bit more water-resistant than regular drywall—those shower walls will eventually fail. Cement board is the only acceptable base for shower and tub surrounds. WonderBoard is made by Custom Building Products. Dimensions are 5 ft. x 3 ft. Thickness options: 7/16 in. and 1/4 in. Why not big sheets? Because at 44 pounds for those reduced-size sheets, it would be far more difficult to carry 4' x 8' sheets. Another reason is breakage: bigger sheets snap off easier in transit. That 7/16" thickness is designed to mate up with the surrounding 1/2" thick green board. You may find WonderBoard a challenge to work with due to its crumbly consistency. The only thing that seems to hold it together is the nylon meshing. The moment you cut it, edges begin to fall apart. The edge, thankfully, does not continue inward, due to the meshing. But you can lose a significant amount of board if you aren't careful. You can cut the backer board in either of two ways: manually (with a utility knife or similar sharp, non-powered device) or with a power tool, such as a grinder equipped with a diamond blade. Cutting WonderBoard with a utility knife is a difficult task, as it requires multiple passes. Crumbs of cement material fall off, while the meshing resists the knife. Using a grinder is better—cleaner, at least. By contrast, HardieBacker, a competing cement backer board made by James Hardie Industries, is smooth and easy to cut manually. No crumbly stuff. Durock, by USG, is a similar competing backer board that you may find easy to cut. Custom Building Products advertises that it has stepped up its game by developing an improved version of WonderBoard. 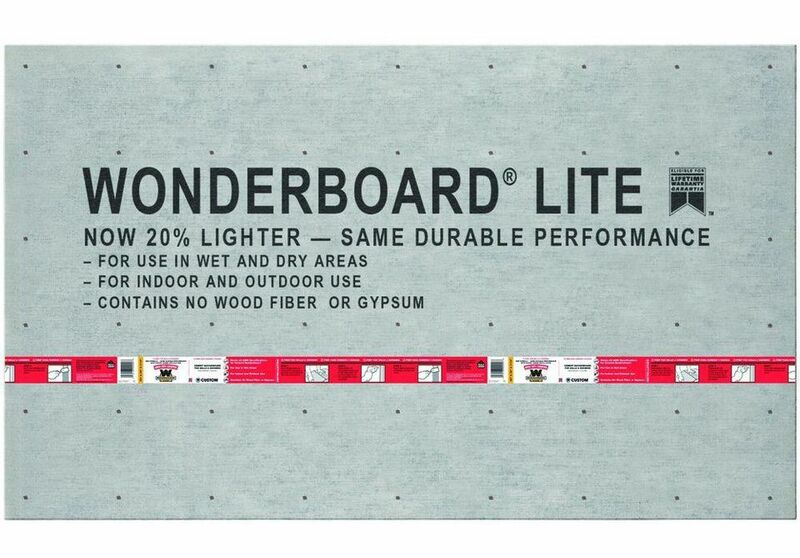 Termed WonderBoard Lite, it weighs in at "20% lighter," according to technical documents. This means that WonderBoard Lite with the green band across it is 22.6 pounds. Keep in mind that the red band WonderBoard (which also displays the "Lite") is still 44 pounds. If you're looking to save costs, you might want to buy WonderBoard. It is consistently less than HardieBacker—about $2 less per sheet—but still hovering around the same price as DuRock Cost-saving is hardly enough reason to switch to WonderBoard. Due to the nature of the cement board, you will not be using this product over great expanses, like whole-house flooring. Instead, it's just a few square feet for your shower.